Runabouts used to be the default style of boat for fishing or family fun. They have more competition nowadays from other layouts but they remain popular, and for good reason: they do the job. They also have benefitted from technological evolution, which has made them far more than just dinghies with windscreens. Local builder Coraline has one of Australia’s biggest range of designs, which includes some thoroughly developed runabouts. The reviewed 525 Explorer is a typical example. Like all the current Coralines it features a Series II hull. Early aluminium boats – and some still built - were rough riders because of their low deadrise hulls: steeper deadrise would have raised the chines out of the water at rest destroying stability. Series II’s more subtle design has sharpened the bottom but balanced it with wide reversed chines. The 525 demonstrated this to me as I boarded by stepping on the edge of the side deck: barely a twitch to acknowledge my off centre weight. The 525 is a model for others on how to organise an opening windscreen. Ahead of the opening mid panel is a hinged section of foredeck allowing easy access to anchoring gear – which includes a realistically large anchor well and an excellent bowsprit. Underfoot is a continuation of the carpeted deck on the same level and with no trip hazards. To each side of this walkway is a raised section segregating gear from the walkway. These sections lift to reveal storage space beneath for smaller items. Other storage spaces include cave lockers below the pair of swivel seats at the dash, side pockets and two lockers within the transom. More specialised spaces are the catch tank and the rod locker. All this is largely invisible and consuming little space that could be used for fishing. A great deal of space can become available. Appropriately swivelled, the first class travelling seats make just as good fishing perches. Steerage class, a settee at the transom, effectively disappears by folding or leaving it at home. It is well known that red cars go faster, and so, apparently, do red boats. Or perhaps it was due to our red runabout having 100hp on the back - this hull works well with 60hp. It was not over powered with the extra 40; it just got to be more fun. It practically jumped onto the plane and begged to be worked hard. In the tightest of manoeuvres the 525 was sure footed, but tight did not mean heavy going at the wheel. The non-feedback steering removed most of the effort. The navigator is supplied with the right tool for dealing with energetic drivers who enjoy 100hp: a massively strong horizontal grab rail mounted above the glove box. Everything about this seating area seems to have been well placed. Seat bases, wheel, throttle and footrests (the rear edges of those under deck storage spaces) are immaculately matched for a comfortable driving experience. This is one of those runabouts that really work; nothing superfluous, nothing obvious missing. Of course the list of expected items is longer than it used to be. Navigation lights are present and correct – there are even special clips to carry the mast when not in use – and the boarding ladder is a heavy, deep tread model. 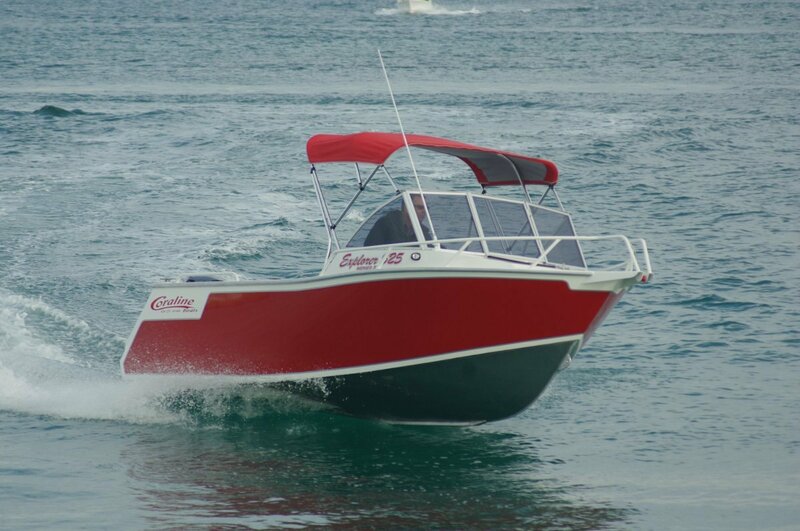 And you get a Bimini that can cope with 100hp speeds.